When did it become extinct? Estimations for the disappearance of these animals vary, but there is a slight possibility that a species of Sivatherium may have survived until as recently as 5,000 years ago. Where did it live? The bones of sivatheres have been found throughout Asia, Europe, and Africa. In the 1930s, a joint expedition of the Field Museum in Chicago and Oxford University carried out some excavations of an early Sumerian site in Kish, Iraq. One of their finds was a copper rein ring, designed to fit on the tongue of a chariot. Decorating the top of this ring is an unusual, horned ungulate. Sumerians normally decorated such pieces with sculptures of horses, but the animal depicted in the Kish rein ring is unlike any living animal. Archeologists, without any knowledge of long-dead beasts, described the mystery animal as a stag, but a young paleontologist saw this ring and realized at once that the sculpture surmounting it appeared to be a Sivatherium, a relative of the giraffe that was previously thought to have disappeared around 1 million years ago. The horns of the sculpture have been broken, but Edwin Colbert recognized the distinctive shape from the Sivatherium skulls he had seen. More important, he noticed the stumpy horns between the eyes and the large horns of the sculpture, a feature unique to Sivatherium. Is it possible that this unmistakable animal survived into recorded history and was known to the early Sumerians? Sumerian craftsmen were not prone to flights of fancy, and the animals we see in Sumerian rein rings are clearly real species known to these people. The animal in the Kish artifact also has a long, heavy rope extending from its snout. Could this indicate that it had been captured alive and tamed? If this theory is proven to be correct, it is an amazing discovery. Sivatherium belongs to a group of animals collectively known as sivatheres, the largest of which was around 2.2 m at the shoulder. Like the living giraffe (Giraffa camelopardalis) and the shy, forest-dwelling okapi (Okapia johnstoni), Sivatherium was a herbivore feeding on grasses, leaves, or bushes, very much like the moose (Alces alces). Offshoots of the giraffe family, the notable characteristics of the sivatheres were the huge horns adorning their strengthened skulls and a pair of stubby horns (ossicones) above their eyes. The combination of a strong skull and huge horns made the head very heavy, and the neck and shoulders of the animal were very strong to support the great weight. 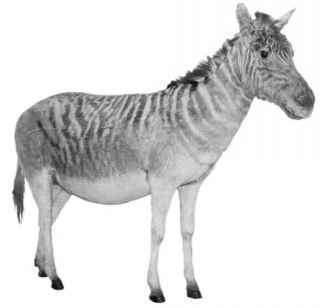 The powerful forequarters of Sivatherium were taller than the hindquarters, giving the animal a sloped back. Modern giraffes have horns, too, but they are relatively short and covered in skin, and the males of these long-necked animals use these horns during the breeding season to assert their dominance over their rivals by standing side by side and swinging their heads into the flanks of their opponents. Sivatherium must have also used its horns during the breeding season, but the large horns may have simply been for display. When two evenly matched males came face-to-face, they probably butted heads and wrestled with their ossicones locked together. Sivatheres appear to have evolved in Asia around 12 million years ago (mid-Miocene). Miocene sivathere fossils are also known from Iran, Turkey, Greece, Italy, and Spain. The animals probably immigrated into Africa at a later date as the oldest sivathere remains from this continent are 5 million years old. These unusual giraffids were successful animals that diversified into several species that succeeded in colonizing a huge area of the ancient earth. What happened to them? Before Edwin Colbert made the link between the Kish artifact and Sivatherium, this extinct beast was thought to have disappeared around 1 million years ago, the victim of climatic change and competition from other herbivorous ungulates. If the Kish artifact depicts a genuine animal that survived until at least 3500 B.c., our explanations for the disappearance of Sivatherium are inaccurate. The discovery of this small copper sculpture has provided us with the intriguing possibility that a species of sivathere survived until the cusp of recorded history and actually occupied a place in the traditions and customs of the Sumerian people. When the Sumerian metalworker created the copper sculpture surmounting the rein ring, Sivatherium may have been clinging to survival in the remote reaches of modern-day Iraq. This fascinating story presents us with the possibility that many other extinct animals survived into far more recent times than bones alone suggest. ♦ The rock paintings of Tassili n'Ajjer, in the Algerian Sahara, depict many different animals, including what appears to be an unusual giraffid. Is this yet more evidence for the survival of sivatheres into relatively recent times? ♦ The surviving relatives of Sivatherium are the giraffe and the okapi, both of which are only found in Africa. The okapi is a shy, forest-dwelling animal that only became known to science in 1912. ♦ Five thousand years ago, Kish in Iraq, was a very different place. It sat at the eastern edge of what has become known as the Fertile Crescent, the arc of land watered by three enormous rivers: the Nile, Euphrates, and Tigris. Today, these areas are semiarid, but five millennia ago, rainfall was much higher. The whole area was very productive and it is considered to be the cradle of civilization, where people first turned from a hunter-gatherer existence to settled societies underpinned by agriculture. These verdant valleys may have been the last stronghold of the sivatheres, and such a rare, impressive animal would have undoubtedly been held in high regard by the earliest civilizations. 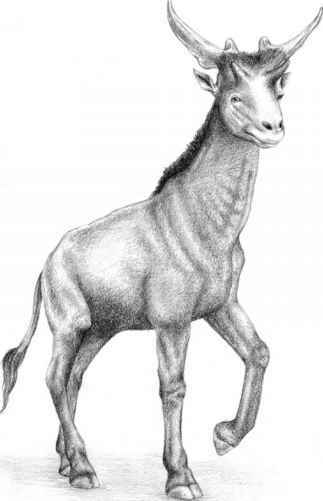 Further Reading: Colbert, E. H. "Was the Extinct Giraffe (Sivatherium) Known to the Early Sume-rians?" American Anthropologist 38 (1936): 605-8. How did the the sivathere live? How did the sivatherium become extinct? Where did they find the fossil of the sivatherium?